Managing epilepsy in women presents neurologists with unique challenges, as the hormonal fluctuations in different stages of life from puberty to pregnancy and menopause may affect seizure control. 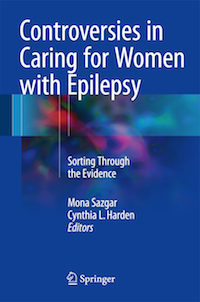 UCI Health epileptologist Mona Sazgar, MD, has edited Controversies in Caring for Women with Epilepsy to help her peers navigate these issues. “We would like to offer our patients a single correct answer to all of their questions, but the truth is that there are often several appropriate treatments,” she said. Sazgar and co-editor Dr. Cynthia Harden seek to provide more clarity by addressing controversial cases related to adolescence, pre-conception, pregnancy and menopause with experts invited to offer their differing views. In a unique approach, Sazgar and Harden acted as “flies on the wall” to observe how their peers interact with patients and family. The book is intended for epilepsy neurologists, but Sazgar believes it may be helpful for some patients who have a deep understanding of their disorder. Sazgar is certified in epilepsy, clinical neurophysiology and neurology by the American Board of Psychiatry & Neurology. The UCI Health Comprehensive Epilepsy Program is a national leader in the diagnosis and delivery of advanced epilepsy care, with the expertise, tools and technology to improve patient’s quality of life. The program holds a Level 4 designation — the highest level — from the National Association of Epilepsy Centers. “We are one of the few epilepsy centers to specialize in the treatment of women with epilepsy, a diagnosis that affects more than 1.5 million in the United States. We provide comprehensive care to those with epilepsy in all stages of life,” Sazgar said. The UCI Health Department of Neurology provides clinical care in all areas of neurology and conducts state-of-the-art research to treat and cure neurological conditions, including stroke, epilepsy, brain cancer and movement disorders. In addition, the department manages a robust residency program and trains many of the neurologists who work in Orange County.